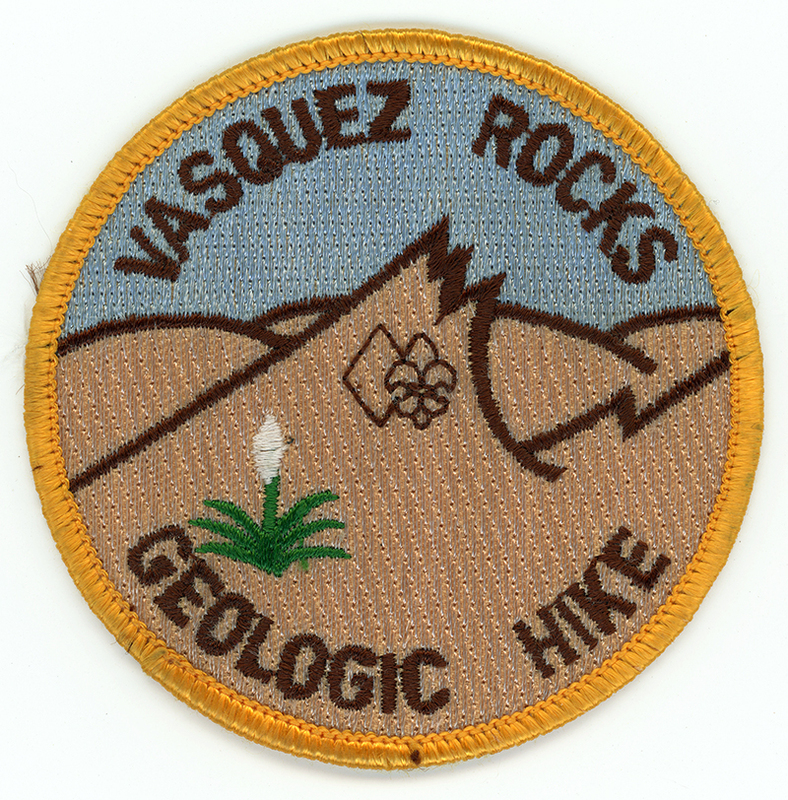 SCVHistory.com LW3261 | Vasquez Rocks | BSA (Cubs/Webelos) Patch: Vasquez Rocks Geologic Hike, 2010s. Vasquez Rocks Geologic Hike. Fabric patch, 3-inch diameter, circa 2010s. Issued by Boy Scouts of America Western Region, Chapter 6: Western Los Angeles County. This award was established to generate an interest in the geologic formation in our area while enhancing the outdoor program in Cub Scouting. The award was developed and sponsored by Manuel Arroyo of Pack 186 in the Antelope Valley District. 1. Meet all applicable general requirements. 2. At least one adult leader has completed the High Adventure Outing Leader Seminar. 3. Cubs, Webelos, Den Chiefs, and Registered Adult Scouters may earn this award by completing the requirements. 4. Before the trip (hike) the participants shall discuss the geologic formation and the San Andreas fault. The hike should be done as a Den or Pack. a. Be in uniform and carry their own personal equipment. c. Bring water for drinking in a canteen. d. Bring a pencil and paper to take notes. 6. Hike shall take a minimum of two (2) hours to complete. 7. During the hike examine the area and take notes/pictures of what you observe. 8. Following the hike, den(s) shall submit a short report to their pack. 9. After completion of the trip, the leader shall attach Den Hike Report (8-1/2 x 11) to your award application and present it to your Council High Adventure Team Approval person for approval. 10. It is recommended that you pick up these awards within 30 days after trip and approval has been attained. 11. These Specific Requirements shall supersede the General Requirements if there is an area of conflict. LW3261: 9600 dpi jpeg from patch purchased 2018 by Leon Worden.